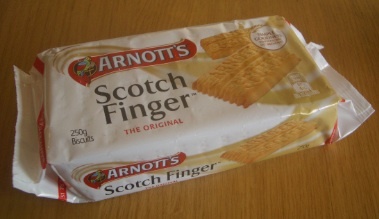 The Scotch Finger is one of the mainstays of Arnott’s range. As well as being available in two different packet sizes (250g and 375g) and as a chocolate coated variant, they appear in several of Arnott’s assortments as well as in those individually wrapped packs you find in hotel rooms (sometimes paired with a much less exciting ‘nice’ biscuit, which brings about all sorts of dilemmas about which to eat first). They even, I am reliable informed, turn up in Australian Army ration packs. The Scotch Finger therefore has deep roots into the Australian psyche. As the name implies, they are a shortbread-style biscuit made with butter (although they also contain vegetable oil). Each biscuit is divided into two fingers, and the two halves can be snapped apart. It is very unusual to do this, however – in fact, I’ve never seen an Australian eat a Scotch Finger in this way. I have found that, by breaking them into individual fingers, they can be used as a kind of edible spoon for consuming little pots of fruit yoghurt; the combination of biscuit and yoghurt leads to a rather pleasant ‘cheesecake-like’ flavour and texture. Each biscuit is around 75mm long and 43mm wide, and a whopping 10mm deep to its highest protuberances. 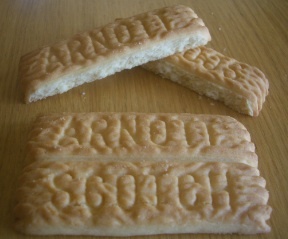 They have a kind of zig-zag pattern at the edges, and the words ‘ARNOTT SCOTCH’ imprinted on the textured upper; clearly there was no room for ‘FINGER’. There are 14 biscuits in a 250g packet; for another bonus point and a chance to win a packet of these biscuits answer this question: How many Scotch Finger biscuits are there in a 375g packet? The Scotch Finger is somewhat different to a Scottish Shortbread biscuit. It is a bit less ‘short’, and has a distinct malty flavour particularly on the aftertaste; the butter is less evident the you might expect. The flavour is actually rather similar to an English ‘Malted Milk’ biscuit (although not at all close to the Arnott’s ‘Malt’o’milk’ variety). The Scotch Finger is also excellent for dunking; it holds up well in hot tea and the flavours blend well. Notwithstanding their undoubted qualities, there are two faults which can affect Scotch Fingers. This is quite unusual, as Arnott’s generally have excellent quality control. The first is caused by rough handling, and leads to a significant build-up of tiny crumbs inside the packet. You can often tell when this has occurred, as the pack appears less smooth (the pictured packet shows this to some degree, although thankfully the biscuits reviewed were OK), and you can hear the crumbs moving when you up-end the packet. (This isn’t Arnott’s fault, I suppose, but they could consider protecting the biscuits in a plastic sleeve as they do with other delicate lines.) Whilst this doesn’t affect the biscuits markedly, it is rather annoying as they do get rather covered in fine crumbs which go everywhere. And it is quite disastrous when dunking; you can expect rapid sludge build-up from such a packet. The second problem is rarer, but more fundamental. Sometimes you get a packet of Scotch Fingers that appear to have been in the oven a bit too long. 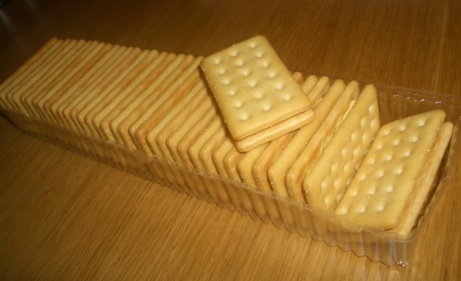 The give-away sign is on the zig-zag edges of the biscuit; they appear much darker than the rest of the biscuit, although the whole biscuit takes on a darker hue. This can affect the taste somewhat, and give a slight ‘burnt cooking oil’ taste to the biscuit. It’s not common, but it happens sometimes. For a company that generally shows such excellent quality control, this is strange to see on such a common variety. Perhaps the sheer number of these being produced makes it hard to spot such problems. Still, don’t let that put you off. The Scotch Finger is an excellent biscuit, worthy of its place in Australian hearts. This little gem of a book is a fantastic read. 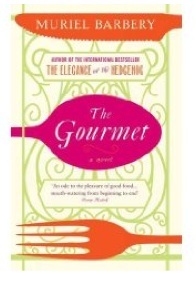 It revolves around the death-bed musings of France’s greatest food critic as he struggles to recall the flavour that is the ‘key to his life’; he reflects on the many extraordinary meals, both great and humble, that he has tasted in an attempt to capture this once-tasted-but-now-forgotten essence. Other voices also add their perspectives, from his family, acquaintances, even pets and the statue on his desk. The descriptions of food in this book are remarkable; extraordinarily sensuous and captivating they explore not only the food itself but the evocations that familiar and unfamiliar tastes, textures and smells conjure in the mind. This book actually has a scent; not literally applied to the pages, but such is the descriptive power of the writing that the actual smells (from oysters to that of a pet dog) seem to emerge from the paper and tantalise the nose. The whole book is also just so French; the entire novel seems to be overlaid with a hint of Gauloises and that unmistakeable odour of the Paris Metro. Indeed, I wish that my schoolboy French was somewhat better so that I could read this book in the original language (although that is not a slur on the excellent translation by Alison Anderson). Despite the captivating descriptions of various banquets, this is actually, though, not a book about food but about how we see ourselves; the pursuit of pleasure for both selfishly and for others, of power and arrogance and how our lives are informed by our experiences. Yes, folks, here it is. The biscuit review you’ve all been waiting for – Arnott’s Lemon Crisp. 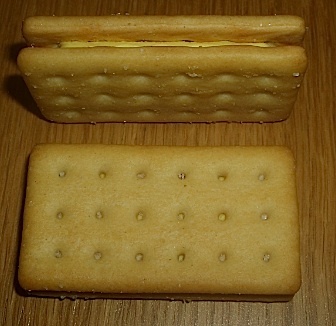 Each biscuit is about 60mm long and 32mm wide; the overall depth is 13mm, with the filling comprising 2.5mm of that thickness (quick maths question; assuming each biscuit in the sandwich is of equal thickness, how thick is just one of the sandwich biscuits? First to answer receives a pack of Lemon Crisps through the post). The are quite attractive, with an even, light-brown bake that is glistens slightly with what looks like sugar. The pack suggests the filling is kind of piped by hand in attractive swirls; in reality it’s more evenly applied. Perhaps the package photography was done on an engineering sample that was created by hand, prior to the mechanisation of production. It is when you eat a Lemon Crisp that it’s secret is revealed. As you bring it closer to your mouth, you can smell the attractive* lemony fragrance. As you bite into it, the biscuit crumbles quite easily; the texture is akin to a TUC biscuit (for the English readers) – very open textured. And, just then, it hits you. They are not sprinkled with sugar. It is salt. This, I have to say, is biscuitry genius. Whoever the person was who, on finalising the recipe for the Lemon Crisp, said – ‘Hmmm, that’s not bad – but what it needs is salt’, well, I bow to them. It is truly inspired. The filling is creamy and sweet with a distinct lemon tang (which comes from real lemon oil, rather than artificial flavour). The crispy biscuit is sweet and moreish. But the salt. Oh my goodness, the salt. It just defies description. It is awesome. After you have finished your Lemon Crisp, you lick your lips. They have the merest hint of salt on them, whilst the lemon flavour lingers on the palate. And you reach for another one. And then another. You have to. I’m surprised Arnott’s aren’t forced to put an ‘addictive substance’ warning on these biscuits, and restrict sales to minors. *Mrs Chillikebab hates the smell of them. Says they smell like washing up liquid. Bah.